Why is Nabeyokocho called Nabeyokocho? | JAPAN THIS! Why is Nabeyokocho called Nabeyokocho? The other day, I wrote about Nakano, where I lived for 6 amazing years. I got to know the area very well over that time. One of the places I knew the best is this small alley. 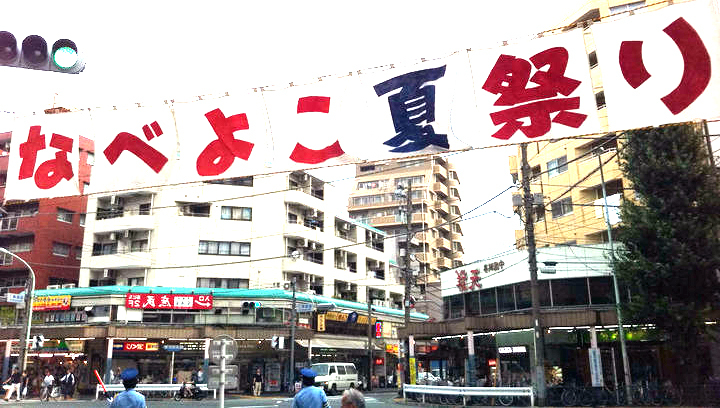 My supermarket was there, my convenience store was there, my train station was there, and my favorite summer festival was there, the 鍋横丁祭り Nabeyokochō Matsuri. The actual name of this area is 鍋屋横丁 Nabeya-yokochō (Nabe Shop Alley), but most of the time it’s usually referred to by locals as just 鍋横丁 Nabeyokochō (Nabe Alley) without the kanji 屋 ten/ya (shop/restaurant). As a nickname, it’s often just called 鍋横 Nabeyoko. I’ve translated this as “alley,” but the meaning is a little different. 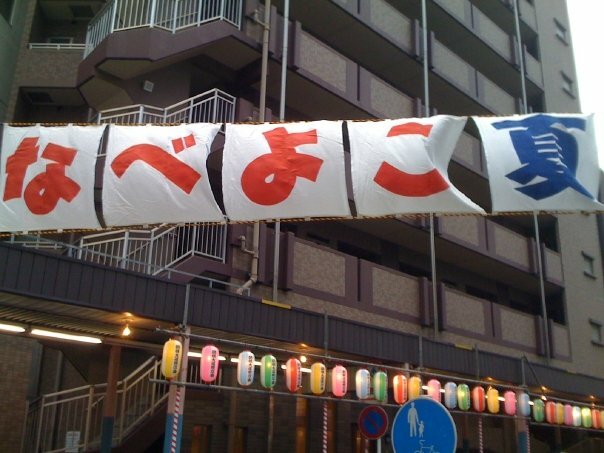 横 yoko, actually means “sideways” and so a 横丁 refers to a small diagonal street that veers off of a main thoroughfare. In this case, Nabeyokochō is a diagonal street that runs between two major streets, 青梅街道 Ōmekaidō and 中野通り Nakano Dōri. Another quick note, Tōkyō streets generally don’t have names. Of course, the major avenues have names, but small streets are usually referred to by their neighborhood names or, more often than not, nicknames and local landmarks. Nabeyokochō falls into this latter category. If you stand at Nabeyochō crossing with your back towards Shinjuku and your face towards Higashi-Kōenji, you’ll see a Tokyo-Mitsubishi UFJ Bank. On this side of the street as you turn left on to Nabeyokochō there used to be a famous tea house called the 鍋屋 Nabeya (I can’t confirm whether or not they had “nabe” but all my sources say it was a 茶屋 cha-ya tea shop). At the top is Omekaido. 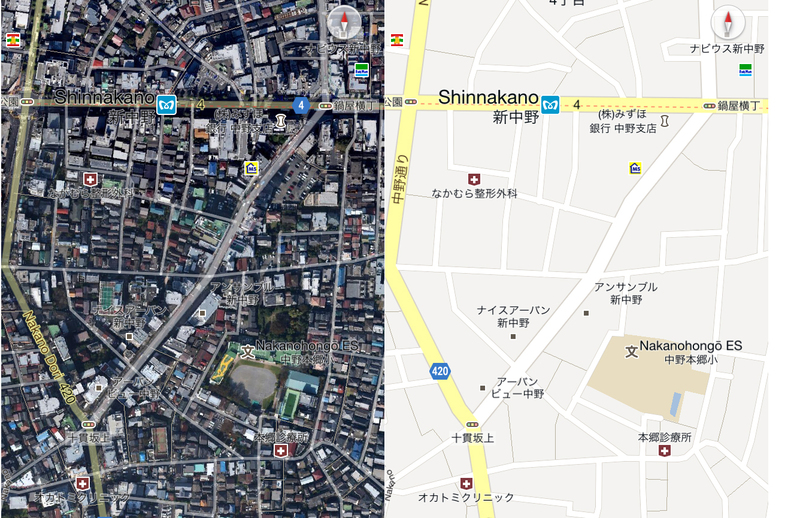 To the left is Higashi-Koenji, to the right is Shinjuku. That diagonal road going from top right to bottom left is Nabeyokocho. Anyways, the street has been referred to as Nabeyokochō since the Edo Period. In the 1970’s an effort was made to revitalize the area. They set up a monument commemorating the Nabeya and explaining the derivation of the name. Since that time there has also been a festival at the end of August called the Nabeyokochō Matsuri. So I assume it’s called Nabeyokocho because it’s lined with Nabe restaurants? Or shops for selling ingredients for Nabe? Or was that in the Edo period and now it’s different? In the article he said it was just one shop. That’s right. It was just one shop. It’s a pity it’s not around anymore. According to the commemorative plaque, there was only one shop with the name “nabeya.” It’s referred to as a tea house and there’s no information as to whether or not they served nabe. My opinion is that “nabeya” is just a name and not a reference to any kind of dish. But unless we find a menu, there’s no way to know for sure. These days there are no nabe shops on the street and the original “nabeya” is long gone.